This aerial view, looking south, was taken between 1964 and 1969. The buildings are the Bonnie Phillips Residence (30 beds), Southard School, and the Chris Luhnow Residence (20 beds). Shortly after opening the sanitarium in 1925, the Menningers established Southard School for emotionally disturbed children, following the advice of Karl Menninger's mentor, Boston Psychopathic Hospital's Dr. Elmer Ernest Southard, who told Dr. Karl "not to forget the children." These four photographs show the completed Children's Division. 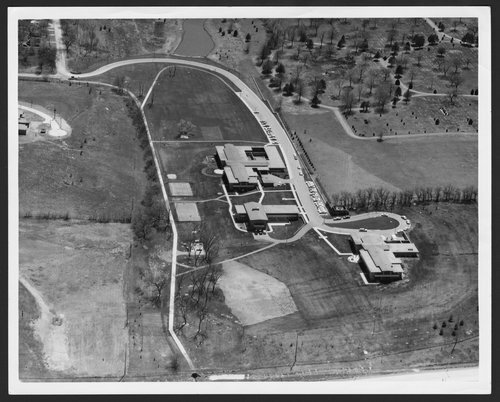 Aerial views of the Menninger Clinic Children's Division in Topeka, Kansas - This aerial view of the completed Children's Division is looking south.